Garrett Swanson is from Washington. He played his college basketball in Idaho. When he decided to transfer after his freshman season in April, he inquired teams in Utah, California and Oregon about his services. But here Swanson is, a 6-foot-7 sophomore, in Milwaukee as Marquette’s latest transfer and Buzz Williams’ newest switchable. The decision wasn’t easy for Swanson, who played one year at Idaho State under Joe O’Brien, who resigned in December after a 2-8 start to the season. Assistant Deane Martin served as the interim head coach the remainder of the season before the Bengals hired Bill Evans in March. Swanson, a walk-on at the time, said he was promised a scholarship under O’Brien but never received one, prompting his search for another school. “I didn’t like what was happening with the new coach and there wasn’t a lot of good coming from it, so I was looking for new opportunities,” Swanson said. Swanson averaged 3.6 points and 1.9 rebounds in 13.2 minutes per game. Swanson was granted his release in April, and began hearing from Division II teams offering scholarships. And while Utah, Sacramento State and Portland State were all options close to home in Spokane, Swanson was looking bigger. It was then that Swanson sent highlight reels from his high school years and freshman season at Idaho State to Marquette. The coaching staff liked what they saw and invited him to take an unofficial visit to Milwaukee. And though Swanson is roughly 1,700 miles from home, once joining Williams and Marquette became an option it was a no-brainer to enroll. Per NCAA transfer rules, Swanson will sit out the 2012-2013 season and have three seasons of eligibility beginning in 2013. And in that time, like transfers Jake Thomas and Jamil Wilson before him, Swanson plans to use that time to grow on the basketball court and in the weight room and classroom. Swanson described himself as a shooter who can play both forward positions and is looking to add muscle. Though he made 3-of-21 3-pointers last year at Idaho State, he shot 46 percent from beyond the arc his senior year of high school. Swanson said Jake Thomas, a sharpshooter in his own right, has helped him with his perimeter game, and that Jamil Wilson has worked with him to improve his low-post game, an area of improvement Swanson hopes to work on this year. Sophomore Juan Anderson likes what he sees thus far in Swanson, and said his acclimation to Marquette’s style will push his progression. 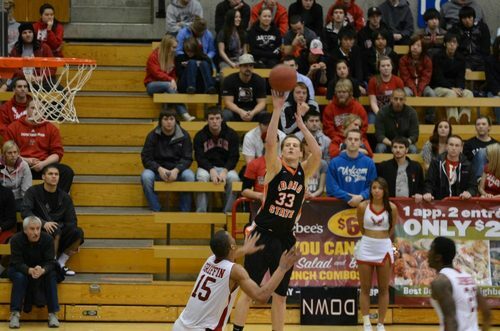 Swanson will be a walk-on this season, and has no promise of a scholarship like he did at Idaho State. But Williams told Swanson that that possibility remains open in the future. “He was telling me I’m gonna have to work for a (scholarship) and show I’m worthy of that,” Swanson said.